Members of the Communications Workers union led a march against the Trans-Pacific Partnership fair-trade agreement in Minneapolis last year. Fast Track would force Congress to take an up-or-down vote on trade agreements without offering amendments. But a large coalition of labor, environmental, family-farm and other grassroots groups are working to slow down fast track, and some powerful allies in Washington are working with them, including U.S. Sen. Al Franken of Minnesota. Franken was one of 12 senators who signed onto a letter to Senate Majority Leader Harry Reid expressing concern that Fast Track shirks the responsibility placed on Congress by the Constitution to oversee trade policy. 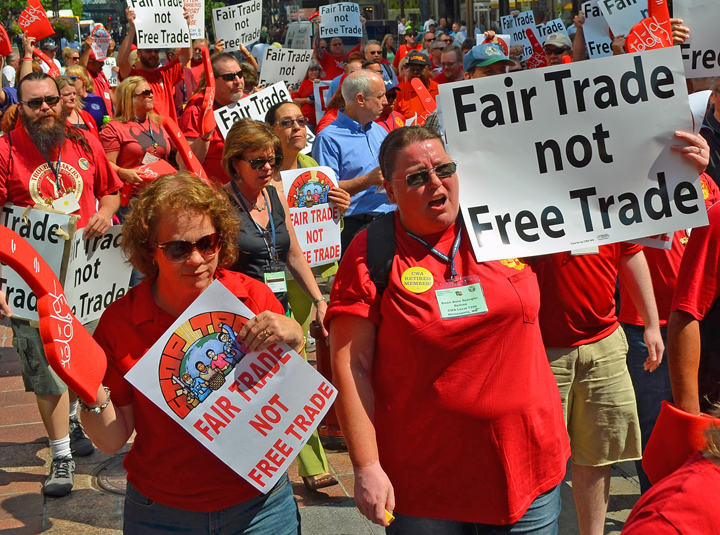 Two weeks later, the Citizens Trade Campaign unveiled a letter signed by more than 550 organizations – including the Minnesota Fair Trade Coalition and the St. Paul Regional Labor Federation – opposing Fast Track. Fast Track was designed in the 1970s when trade negotiations were focused on cutting tariffs and quotas. Today’s pending “trade” agreements … are much broader – setting binding policy … relating to patents and copyright, food safety, government procurement, financial regulation, immigration, healthcare, energy, the environment, labor rights and more. Such a broad delegation of Congress’ constitutional authorities is simply inappropriate given the scope of the pending ‘trade’ agreements and the implications for Congress’ core domestic policymaking prerogatives. Obama has said Fast Track is key to one of his administration’s top trade priorities, the Trans-Pacific Partnership. An agreement with 11 Asian and Latin American countries, the TPP would replicate and expand on previous free-trade agreements like the North American Free Trade Agreement, which has resulted in a net loss of 1 million jobs since its passage 20 years ago. What’s more, the TPP is being negotiated in secret. Drafts and proposals used during the negotiations are classified, keeping both the media and members of Congress mostly in the dark. About 600 “cleared advisors” have access to TPP drafts, including representatives of multinational corporations like Walmart, Cargill and Monsanto.